It is with great pleasure to introduce you all to Justyna from Love Lives in The Kitchen and so it does. She is delightful, She is Polish married to an Italian and lives in Milan. 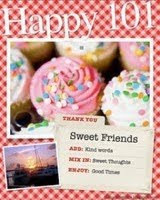 Her blog is filled with great food and family recipes long passed down and great pictures of life, its food for the soul. A while back Lisa did a great guest post using Orrechiette pasta (little ears) and Italian Sausageand Justyna told me this pasta is made in her husbands home town. So of course I asked her for a recipe, what a treat to learn from her and her Husband about this wonderful pasta. I can't wait to make this and I know you will all be doing the same!! So, today’s recipe is “orecchiette al forno” (orecchiette from the oven) with tomato, mozzarella and grana padano (or parmigiano) cheese. You can also use gnocchi if you prefer: both are perfect for this recipe. Preheat the oven to 200°C (390°F). If you use fresh tomatoes immerse them for few seconds in the boiling water and take off the skin. 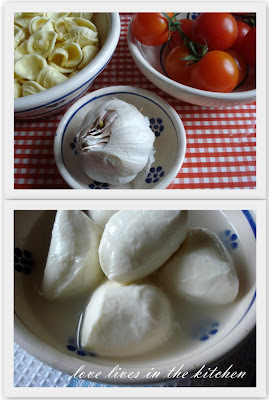 Cut mozzarella in small cubes. Heat 2 tablespoons of olive oil together with few garlic cloves. When the garlic becomes brown remove it from the pan. Add the tomatoes (fresh or tomato sauce) to the oil and cook under cover on a small fire for about 10 minutes. Add salt and pepper and few chopped basil leafs (if you wish). Cook orecchiette in salty water less than you would cook them usually (for fresh orecchiette 4 minutes will be enough, for the dry ones about 10-11 minutes). The orecchiette must be “al dente” (not too soft) as they will soften in the oven. Mix strained orecchiette with the tomato sauce and add mozzarella cubes. Put the pasta in the baking pan (I always use the ceramic one) and sprinkle generously with grana/parmigiano (I prefer grana, it’s sweeter and more delicate). Put in the oven and bake for about 15 minutes. Serve very hot and sprinkled with grana/parmigiano. Enjoy the orecchiette with a glass of good red wine. What are you waiting for? 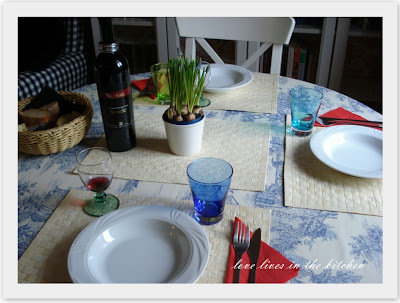 A tavola! Such a simple and delicious pasta recipe. I ll give it a try this weekend. Great guest post!!! I love how you've turned a few simple ingredients into something spectacular! Just delicious, Rebecca!!!! This sauce really looks wonderful! simplicity in the ingredients can result in complexity of flavor - well done! this is pasta-licious... love that ir's simple and easy fixin! This sounds wonderful! What a fabulous way to put together simple ingredients and come up with something special! 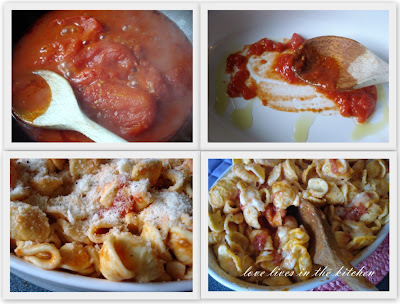 Great guest post--it looks like a very simple and wonderful pasta! I love all types of pasta that are hand made, even more when they are cooked in a simple and delicious way as in this one. Most excellent. Simple but nice combination of flavours! I love orecchiette. The little ears are the perfect vessels for pasta sauce. Great guest post! Rebecca, what a delicious pasta dish! I definitely will check out Justyna's site for more terrific recipes like this. You always have interesting creative guest on your blog... many thanks. This looks fantastic! I love anything with fresh mozzarella, especially pasta! Oh my god, I want that now. For breakfast. And I want to eat it at that table, not mine. Because I'm sure it would taste even better that way. Just found your blog and I love reading it! Can't wait to follow it! what a nice discovery...i like it! I do make this - and it is indeed delicious and the best meal for a week night. And it goes - fast. Grand photos! thank you very much rebecca! i'm honoured. i posted a message on this guest post on my blog. Looks delicious and very doable ;) Thanks for sharing! great guest post, this looks wonderful! This looks so wonderful. Much better than the ground beef I have thawing in my sink. What a simple yet yummy pasta dish! There are so many delicious variations just starting with this simply lovely recipe. Thank you, Justyna, for sharing with us! I love orrechiette past with broccoli and chicken sausage. This looks lovely too! Can't wait to try it out. Thank you for featuring this guest post. I want to make this recipe soon. Great ingredients. More please! What a wonderful recipe for a guest post! Pasta with cheese is a favorite for me :D Glad to have found your blog Rebecca. this is a great dish with fresh tomatoes and mozzarella! Great guest post!thank you. hello , my two favorite bloggers in one place and making pasta, yumm!!! although never cooked with fresh mozzarella :(. Thats a simple and delicious dish, thank you! What an absolutely beautiful recipe! Thank you for introducing us! Fresh and simple and wonderful! Also, your Turkey Keema looks to die for! Think orrechiette is such cute pasta! I have some in my pantry right now. Sometimes I just eat it with cheese sprinkled on it! Love this easy recipe- most of us have the ingredients at hand. Great guest post from a Milan blogger, Rebecca! Those Italians know exactly how to make a simple pasta dish taste divine. I am half Polish/half Italian married to an Italian. My husband will not eat red beets when I married him. So I understand about a husband that asks for traditional Italian food. I have slowly turned him onto beets- making beet pasta. ha ha. But he is a good sport and really loves most cuisines. Fantastic guest post! Hmmm...mm... more pasta recipe.